We can guarantee that you won’t find ProGARM’s exclusive designs anywhere else. We see it as flattery that ProGARM features and garments are regularly copied and sold as being as good as ProGARM. It’s up to you to make the judgement about which will provide the best protection for your team. The one thing that we can guarantee is; if it doesn’t say ProGARM, it’s not ProGARM. Our brand stands for the ultimate in wearer protection, comfort and value for money through the quality and durability of our Arc Flash garments. 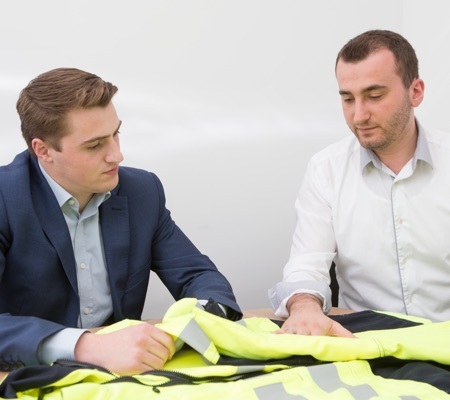 Designed by our specialist in-house team, working on nothing but Arc Flash protection, only ProGARM Arc Flash garments use our unique VXS+ fabrics combined with ThermSAFE components. This creates the ultimate in Arc Flash and flash fire resistance. Other manufacturers may claim their garments offer the same comfort and protection, but beware of imitations. Only ProGARM Arc Flash clothing has been subject to our stringent testing in addition to the required EN standard tests. Only ProGARM Arc Flash garments provide you with the fit and function to make us the first choice for your team. All our garments are designed with the end user firmly in our sights. Every seam, pocket and piece of stretch tape work together to create the best performing Arc Flash garment. However, we don’t stop there. Through constant innovation, we consistently develop our Arc Flash clothing to improve the comfort, fit and breathability of our products. With ProGARM, you’ll find unique Arc Flash clothing solutions that your team will enjoy wearing every day. Remember, if it doesn’t say ProGARM, then it’s not ProGARM.